There appears to be a black-list on the "anything but" main stream media, so Doctor Zin has requested bloggers all over the world to get the word out. I intend to do everything I can to help him. I hope you will do the same. If you follow the news you may have seen this picture, of Iran's President Ahmadinejad speaking at the "World Without Zionism" conference where he spoke of wiping "Israel off the map." But in this photo you can only see a portion of the graphic. The rest of the graphic speaks a thousand words. What is the message they are trying to send? Yes, that is the USA already at the bottom of the hourglass. 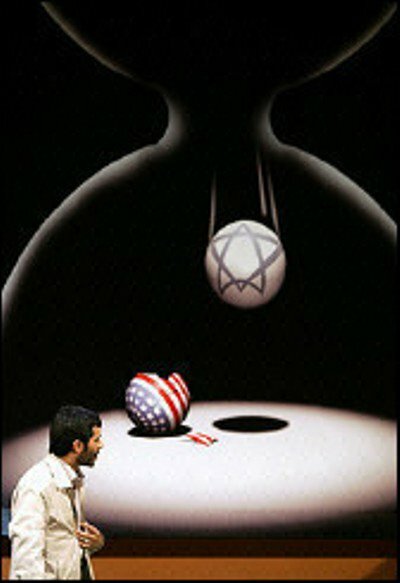 But notice that the USA is already broken in the bottom of the hourglass prior to the fall of Israel. So how would the Iranian regime achieve this? We have a strategy drawn up for the destruction of Anglo-Saxon civilization... we must make use of everything we have at hand to strike at this front by means of our suicide operations or by means of our missiles. There are 29 sensitive sites in the U.S. and in the West. We have already spied on these sites and we know how we are going to attack them. But it is not only the US that Abbasi wants to take on and humiliate. He has described Britain as "the mother of all evils". In his lecture he claimed that the US, Canada, Australia, New Zealand, Israel, and the Gulf states were all "children of the same mother: the British Empire." As for France and Germany, they are "countries in terminal decline", according to Abbasi. "Once we have defeated the Anglo-Saxons the rest will run for cover," he told his audience. So it appears that in the short term, the regime is hoping to start a limited war with the USA that it believes it can survive, since they don't believe that the West has the will nor the means to occupy Iran at this time. This will buy them time for their longer term strategic plans for the world. Why is no taking these threats seriously? The vast majority of the people of Iran do not share his views and long for real democracy in Iran. 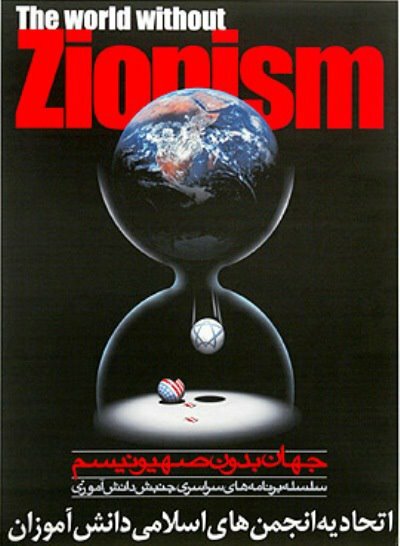 How long will we wait to support the people of Iran in their struggle to free themselves from these dangerous mad men? All credit is due to Doctor Zin at Daily Briefing on Iran. Technorati tags: Iran, WMD, Terrorism, Israel, USA, and media.